The orchestra was originally founded as an evening class in 1988 and was known as the "Adult Education Orchestra". Their first ever concert was performed in Itchen Abbas Village Hall in June 1989. There were 16 members then: 6 clarinets, 2 flutes, 2 'cellos, 1 french horn, 1 viola, 3 violins and 1 tenor sax! The programme for that first concert included "French Comedy Overture" (Bela), "RAF March Past" (Walford Davies), a waltz from "Der Rosenkavalier" (Strauss), plus a selection of other short pieces. 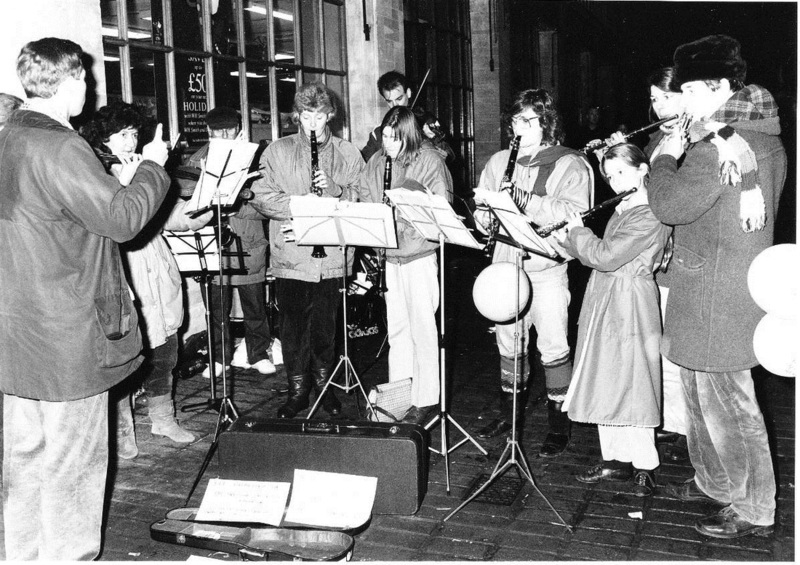 Busking during a late night shopping evening leading up to Christmas. 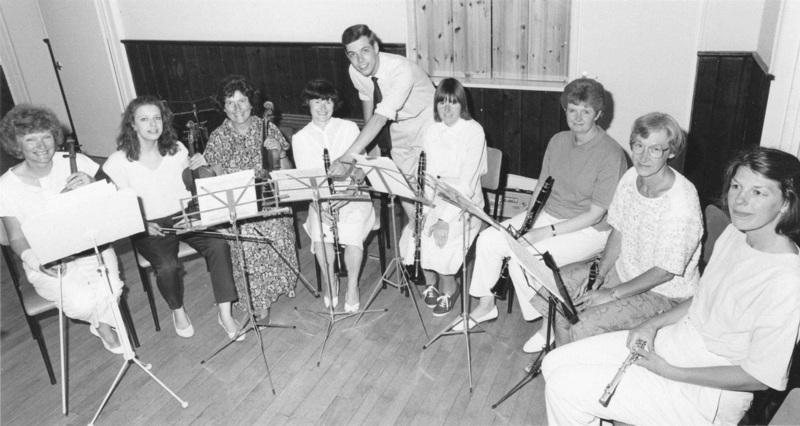 In September 1991 Hampshire County Council withdrew funding for non-vocational courses and so the members decided set up their own orchestra, paying a subscription to keep it going. 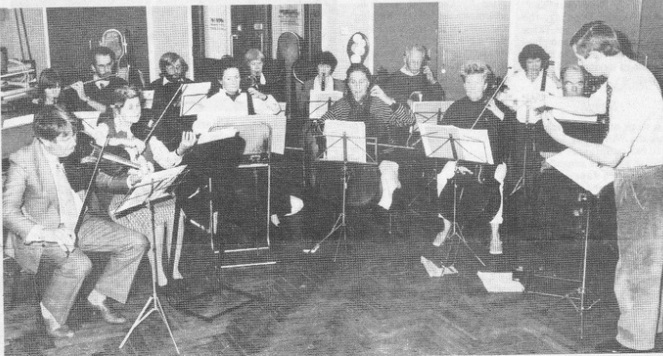 The orchestra's name changed to "Winchester Amateur Chamber Orchestra" and had grown to 30 members. "Winchester Amateur Chamber Orchestra" with conductor Peter Parfitt. The orchestra matured under Robin Browning's musical directorship into a competent amateur orchestra which draws adult members of all ages from across Hampshire playing full works. The orchestra developed a clear identity as a chamber orchestra, with limited wind and brass forces. The orchestra has performed a wide repertoire over the years including the classical and early romantic eras of Mozart, Haydn and their contemporaries as well as Beethoven, Brahms, Schumann and Schubert symphonies in recent years. We also aim to provide opportunities for promising young professional soloists to perform with an orchestra. In September 2005, Gregg Hollister succeeded Robin as musical director, and soon established himself as a popular and enthusiastic conductor, with a growing track record of successful public concerts. During the winter of 2006/2007, WCO gave two performances of John Rutter's splendid Magnificat with Larkhill Choral Society. This has a technically challenging and very modern full orchestral accompaniment, and a soprano solo. Gregg continued to develop the orchestra's skills with this type of steady innovation, and built a solid base of repertoire that can be recalled and repeated as occasion demands. In January 2008 the orchestra gave a memorable performance that included German's triumphant Welsh Rhapsody, and Brahms' 2nd Symphony. Shortly afterwards Gregg married the orchestra's Leader, Yvette, announced his resignation and carried her back to his native Wales, a very happy end to his highly successful three year appointment. In 2008, Gregg was succeeded by Craig Lawton, who studied under Robin Browning. In March 2009, the orchestra took part in the "Haydnthon" at the Turner Sims Hall, Southampton, performing 4 symphonies, as their contribution to the BBC Children in Need charity appeal. The orchestra's repertoire is now wide and mature. Under Craig's directorship members have had the opportunity to play in Germany and Italy as well as London and Southampton. He has a passion for encouraging talented musicians at the start of their careers and that is demonstrated in his choice of guest soloists. And Sarah (the orchestra leader) together with another young mum started the programme of annual children's concerts in 2012. The aim was to provide an experience for young children (aged 3 to 9) of an orchestral performance that was suitable for their age but sit a classical music experience. These concerts have proved very popular and always oversubscribed. Craig continues to challenge the orchestra to perform a wide range of classical works. The orchestra's ethos is still one of encouraging musical educational experience both for the members, soloists and audiences but it has certainly changed beyond recognition from those early days as a small adult education class! See our concerts page for our forthcoming concert information.